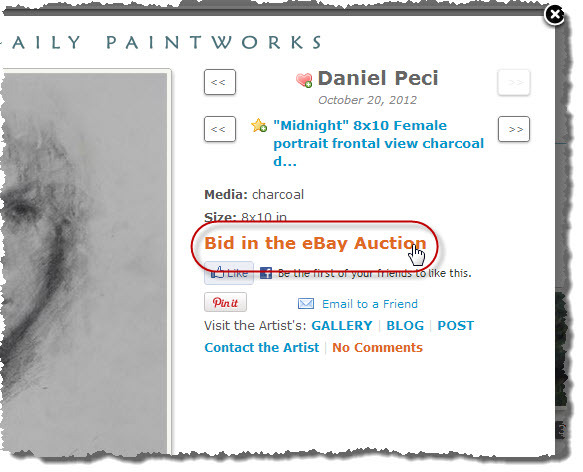 DPW lets you set the Buy URL for artwork in DPW to an active eBay auction. This allows buyers to click on a Bid in the eBay Auction link in the pop-up, which appears when they click one of your thumbnails. 1. Unhide the eBay Item Id column in your Art Tracking grid, if it isn’t yet visible. Do this by checking the column check box in any one of the column header drop down menus that appear when you mouse over a column header and click the down arrow that appears to the left of the header label. 3. 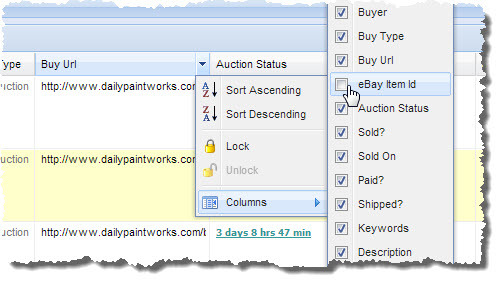 To update the statuses of your eBay auctions in DPW, just click the Update eBay Statuses button above your Art Tracking grid in your browser. Then you will be able to see the current auction status and DPW will pull in the latest bid, if any, and set the artwork’s price to its value. Keep in mind that DPW only charges a 3% sales commission if you sell through our optional DPW Auctions and charges no commission on any other selling method, such as eBay, Etsy, DPW generated PayPal links, etc. Posted - Sat, Oct 20, 2012 at 6:20 PM. This article has been viewed 6302 times.